Demyelinating pseudotumor, Misdiagnosis, Imaging characteristics, Clinical symptoms. At present, the pathogenesis underlying demyelinating pseudotumor remains elusive, probably affected by hereditary factor, virus infection or medication use etc., [1-3]. Demyelinating pseudotumor mainly attacks in teenagers, more commonly seen in female compared with male counterparts . The tumor size is >2 cm in diameter. No evident symptoms occur upon the onset. It is mainly characterized with acute or sub-acute episode. In this report, we have reported a male patient, aged 56 y, presented with sub-acute onset due to left limb weakness. The male patient, aged 56 y, was admitted to hospital due to left limb weakness for 2 weeks. Physical examination upon admission revealed that body temperature was 36.6°C and blood pressure was 140/80 mmHg. The patient remained mentally conscious and could communicate normally. The Glasgow Coma Scale score was assessed as 15, suggesting that the patient suffered from minor brain injury. Bilateral pupil size was measured as 3.0 mm in diameter with sensitive direct and indirect light reflex. His left limb muscle strength was assessed as grade IV and grade V for the right limb muscle strength. The limb muscle tension was evaluated as normal. No edema was documented in bilateral lower limbs. Physiological reflex was normal and pathological reflex was not noted. Twenty years ago, he underwent bilateral fronto-temporal decompressive craniectomy due to craniocerebral trauma. Written informed consents were obtained from the family members of the patient. Head CT of the outpatient: Multiple hypointensity lesions and suspected isointensity nodes were noted within the brain, which were considered as space-occupying masses. Following decompressive craniectomy, the signs of multiple encephalomalacias were observed (Figure 1). 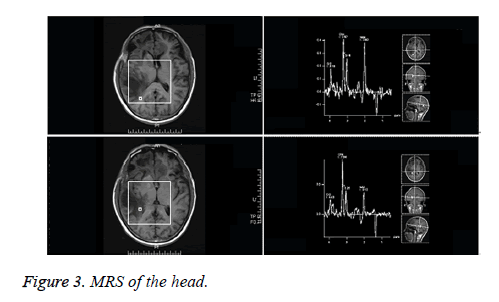 Plain head MRI and enhanced MRS upon admission: multiple masses of slightly long T1 and long T2 signals were noted in the right frontal lobe, left frontal lobe proximal to corpus callosum and right temporoparietal lobe. Hypointense signals were observed on Diffusion Weighted Imaging (DWI). No contrast-enhanced signals were noted on the enhanced MRI, indicating no incidence of cerebral ischemia. Nodular long T1 and T2-signal was noted in the right centrum semiovale and brain stem. T2 flair hypointense signal was detected on the MRI, as illustrated in Figure 2. Single and multi-voxel 1H-Magnetic Resonance Spectroscopy (MRS) were carried out (TE=135 ms). The right temporal lobe, focal and peripheral lesions in the basal ganglia region were located as the region of interest and statistically compared with the imaging findings of the contralateral normal region, hinting decrease in NAA peak, increase in Cho peak, decrease in Cr peak, decrease in NAA/Cr ratio and increase in Cho/Cr and Cho/NAA ratio in the right lesions. Inverted lactate peak was detected. In the center of the lesions, decrease in NAA, Cho and Cr peak was observed (Figure 3). Inverted lactate peak was found. No other abnormality was documented. Figure 1: CT scan of the head. Figure 2: MRI of the head. Figure 3: MRS of the head. Conventional cerebrospinal fluid and biochemical examination: A relatively high level of protein was detected in the cerebrospinal fluid. Blood routine examination found a slightly high level of leukocyte. The examination outcomes indicated the possibility of intracranial demyelinating lesions. The final diagnosis was confirmed by subsequent biopsy. Percutaneous brain tissue biopsy was performed via the temporo-occipital junction behind the ear. The blood loss was 100 ml during surgery. Intraoperatively, yellow colloid-type lesions with soft texture were noted in the subcortical brain tissue (Figure 4). Figure 4: Gross observation of the excised tissue. The deep layer of the lesions was excised and no explicit margin was observed, significantly differing from the brain tissue from healthy counterparts. After tissue sampling, the incisional wounds were sutured. Immunochemical staining revealed positive for CD68, GFAP, Vim, S-100, MBP and Olig-2 and negative for CK, EMA, NSE, NF, Syn and CD34 (Figure 5). In this report, the male patient, aged 56 y, presented with subacute onset due to left limb weakness. He reported no family history, virus infection or use of chemotherapy agents. Therefore, the exact pathogenesis remained unclear. Demyelinating disease, dominantly involved with the frontoparietal lobe, is mainly characterized with dysfunction and refractory high intracranial pressure, leading to a high risk of relevant symptoms, such as limb and trunk dyskinesia, epilepsy, headache, nausea, vomiting and optic disk edema, etc. These symptoms can be aggravated due to the edema severity. It presents as a solitary contrast-enhanced mass and poses a diagnostic challenge for both radiologists and surgical pathologists to distinguish demyelinating tumors from astrocytic gliomas. Initially, CT plain scan hinted that the possibility of metastatic tumor was suspected due to multiple lesions with hypointensity accompanied by severe edema. MRI findings demonstrated multiple abnormal signals in the white matter of bilateral cerebral hemispheres. The pathological changes presented with long T1 and T2 signals. Since the blood-brain barrier was destroyed, significant transient enhancement was noted within the lesions and decreased along with the mitigation of inflammatory response. In this report, we also identified open-ring signs in the contrast-enhancing demyelinating lesions with unclear margins, which were surrounded by edema signs with hypointense signals. White matter of the brain is abundant with myelinated nerve fiber, whereas no myelinated nerve fiber is present in the brain cortex and gray matter, probably leading to a higher risk of demyelinating pseudotumors occurring in the white matter of brain. The patient in this report had sub-acute onset. He was pathologically characterized with myelin sheath injury, whereas the nerve axon was intact. A high quantity of lymphocyte infiltration in a cuffing pattern was observed surrounding the vessels under light microscopy. However, a large amount of monocyte and froth-shaped macrophage infiltration was noted in the myelinoclasis region, accompanied by proliferative spongiocyte. Lymphocyte and macrophage infiltration is a common manifestation of demyelinating pseudotumor, which is consistent with the patient in this report. Demyelinating pseudotumor is highly sensitive towards the adrenal cortex hormonotherapy and yields relatively favourable prognosis [6-8]. Plasma exchange is recommended for patients who are untreated with glucocorticoid administration. To prevent the progression into multiple sclerous demyelinating pseudotumor, interferon administration is highly considered to alleviate the injury, interfere the progressive development and improve clinical prognosis [9,10]. In this report, the patient was administered with methylprednisolone after surgery and clinical symptoms were significantly mitigated. Nevertheless, the long-term clinical efficacy remains to be elucidated by subsequent follow-up. Comprehensive understanding of medical history, clinical manifestations, imaging and pathological characteristics contribute to clinical diagnosis and management of demyelinating pseudotumor. For juvenile patients with sudden onset, accompanied by a history of multiple sclerosis, vaccine inoculation or virus infection and lesions with open-ring signs vertical lateral ventricle, the possibility of demyelinating pseudotumor should be highly considered. Prior to surgery, hormone treatment or brain tissue biopsy can be performed initially to avert the serious damages and complications to the nerve function induced by excessive surgery and/or radiotherapy, etc. Kepes JJ. Large focal tumor-like demyelinating lesions of the brain intermediate entity between multiple sclerosis and acute disseminated encephalomyelitis: A study of 31 patients. Ann Neurol 33: 18: 1993. Ahintas A, Petek B, Isik N,Terzi M,Bolukbasi F,Tavsanli M,Saip S,Boz C,Aydin T,Arici-Duz O,Ozer F,Siva A. Clinical and radiological characteristics of tumefaetive demyelinating lesions: follow-up study. Mul Scl J 2012; 18: 1448-1453. Kaeser MA,Scali F,Lanzisera FP,Bub GA,Kettner NW. Tumefaetive multiple sclerosis: an uncommon diagnostic challenge. J Chiropr Med 2011; 10: 29-35. Sugita Y, Terasaki M, Sbigemori M, Sakata K,Morimatsu M. Acute focal demyelinating disease simulating brain tumors histopathologic guidelines for an accurate diagnosis. Neuropathol 2001; 2l: 25-31. Masdeu JC,Quinto C,Olivera C,Tenner M,Leslie D,Visintainer P. Open-ring imaging sign: highly specific for atypical brain demyelination. Neurol 2000; 54: 1427. Ahintas A, Petek B, Isik N, Terzi M,Bolukbasi F,Tavsanli M, Saip S,Boz C,Aydin T,Arici-Duz O, Ozer F,Siva A. Clinical and radiological characteristics of tumefactive demyelinating lesions: follow-up study. Mul Scl J 2012; 18: 1448-1453. Al-Noury K, Lotfy A. Computed tomography and magnetic resonance imaging findings before and after treatment of patients with malignant external otitis. Eur Arch Otorhinolaryngol 2011; 268: 1727-1734. Seifer CL, Wegner C, Sprenger T, Weber MS,Brück W,Hemmer B, Sellner J: Favourable response to plasma exchange in tumefaetive CNS demyelination with delayed B-cell response. Muh Scler 2012; 18: 1045-1049. Qi W, Jia GE, Wang X,Zhang M,Ma Z. Cerebral tumefactive demyelinating lesions. Oncol Lett 2015; 10: 1763-1768. Xia L, Lin S, Wang ZC,Li SW,Xu L,Wu J, Hao SY,Gao CC. Tumefactive demyelinating lesions: nine cases and a review of the literature. Neurosurg Rev 2009; 32: 171-179.